An unprecedented crowd came to see Bolton Wanderers play West Ham in the 1923 FA Cup Final. Just before the game was due to begin, a mass of people overflowed onto the pitch. 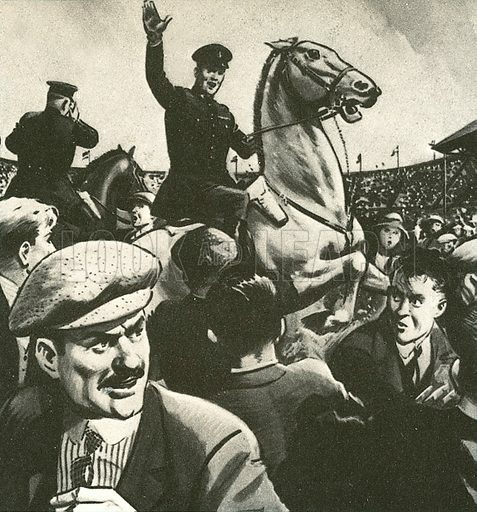 Riot and disaster seemed imminent, but the day was saved by mounted policemen, and one in particular on a white horse, who brought the crowd under control. The match was being played at Wembley stadium. 240,000 people are thought to have squeezed into a stadium built for 127,000. The event became known as the White Horse Final. Available worldwide for immediate download up to 3,861 x 4,144 pixels.